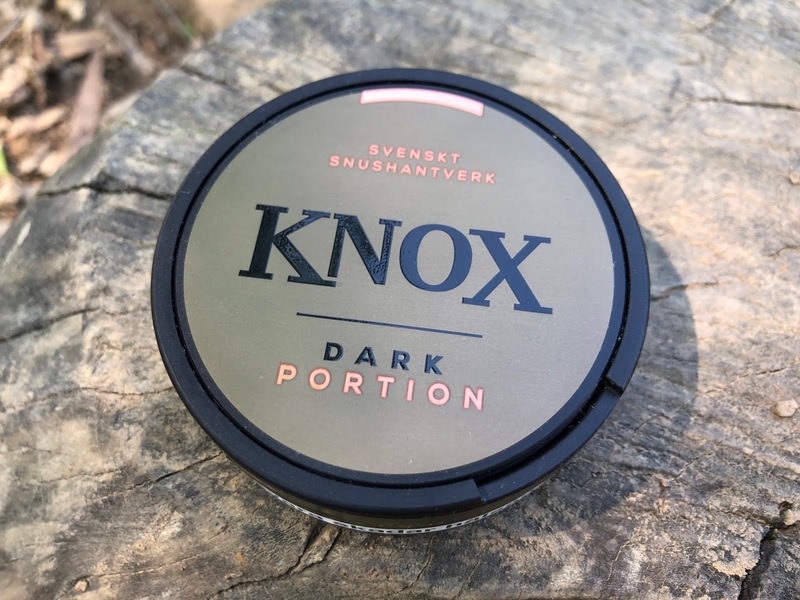 Knox Dark (Original Portion) - Review. 23 April 2019. I don't think I've ever had more requests to review a product than I have with this one, so, today we're talking about Knox Dark, a new product from Skruf! I think this is a smart release by Skruf, for a few reasons. First, Skruf doesn't have a tobacco-centric product to compete with Grov. Second, Knox is incredibly popular, so it makes sense to launch this flavor in the Knox range. 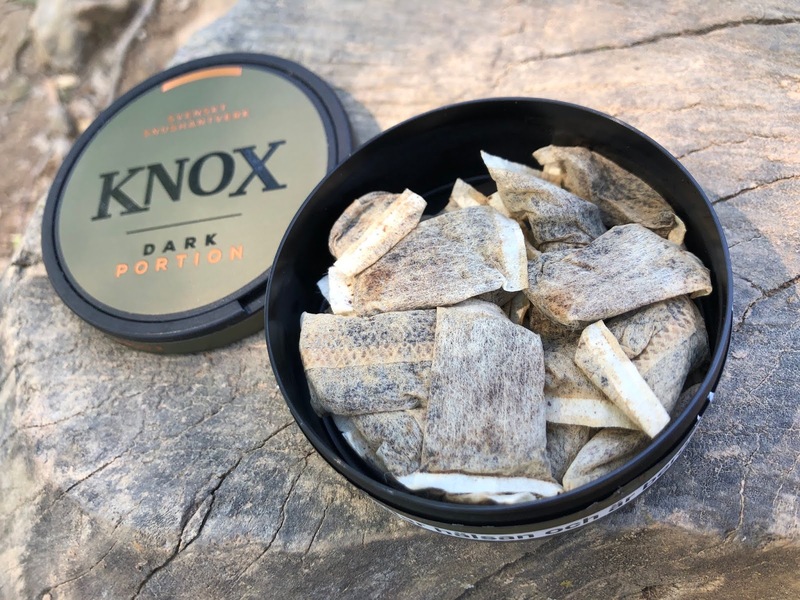 Knox Dark is a tobacco-centric flavored snus which comes in portion and los! Yes, a new los product as well, which doesn't seem to happen much anymore. The flavor description says "Knox Dark has a full and rich flavor combined with a light smokiness". It comes in a 21.6g can with 24 portions for 0.9g portions. The nicotine content is 8mg/g (0.8%) which breaks down to 7.2mg/portion. Knox Dark has a really powerful aroma. As soon as you open the can there's a big, robust tobacco smell that comes through. As Grov comparisons are inevitable, I will say this one seems to have a heavy wood presence in the aroma, and it seems to be a little smokier. The portions are plump, moist, and have a quick flavor release. The taste of this stuff is great. Nowadays, most new products are mint, so this one really stands out to me. The flavor is a bold, present, robust tobacco flavor. The wood taste is also very present and works very well with the tobacco taste; it provides a very natural flavor experience. The smokiness stays in the background, and serves as more of a compliment to the tobacco taste, it doesn't overtake it by any means. The nicotine strength feels to be about the regular strength level, and I find the flavor lasts around 45 minutes on average. I was really impressed with this product. There aren't many budget snus products with a tobacco flavor and this one will do really well, I suspect. It's priced on SnusBolaget at 27kr (2.90 USD) compared to Grov at 46kr (4.94 USD), so it's certainly a cheaper alternative, but with a premium taste! Lundgrens Västkusten Vit - Review. 20 April 2019. Lundgrens Västkusten is a semi-new product from Fiedler and Lundgren. I say "semi-new" because it's basically the same thing as Lundgren's Marstrand, which was a limited edition product I reviewed back in 2018. Västkusten means "west coast", so this product is one that corresponds with that region of Sweden. Marstrand is off the west coast of Sweden, which makes sense given that this one has the same flavor. The flavor description for this product says, "With taste of the west coast nature: Lundgren's Västkusten has a flavor that is inspired by the west coast's cliffs and vegetation found there. The flavor is reminiscent of wild rose and citrus, together with a tobacco tone. It also has earthy and floral background tones from heather contribute to the flavor." Like the other Lundgrens products, it comes in a 21.6 gram can with 24 portions for 0.9 gram portions. The nicotine content is 10mg/g (1.0%), or 9mg/portion. Lundgrens considers their product line a "taste journey across Sweden". Each release has a flavor that corresponds with a certain region in Sweden. Lundgren's Norrland is inspired by the northern forests of Sweden. Lundgren's Skåne is inspired by the southernmost county of Sweden. And now, Lundgrens Västkusten is inspired by Sweden's west coast! The other two also come with a slim white version, but this one does not as of the date of this review. This one will be an easy one to review, as it's the same as the Lundgrens Marstrand I reviewed last year. Even though this one isn't being marketed as "sea inspired" like Marstrand was, this one still reminds me of the sea. There is a present, lightly sweet smell of rose, along with a light herbal presence and a mild tobacco character. The portions come in the perforated format, which means they are like regular white portions but with little holes in them. 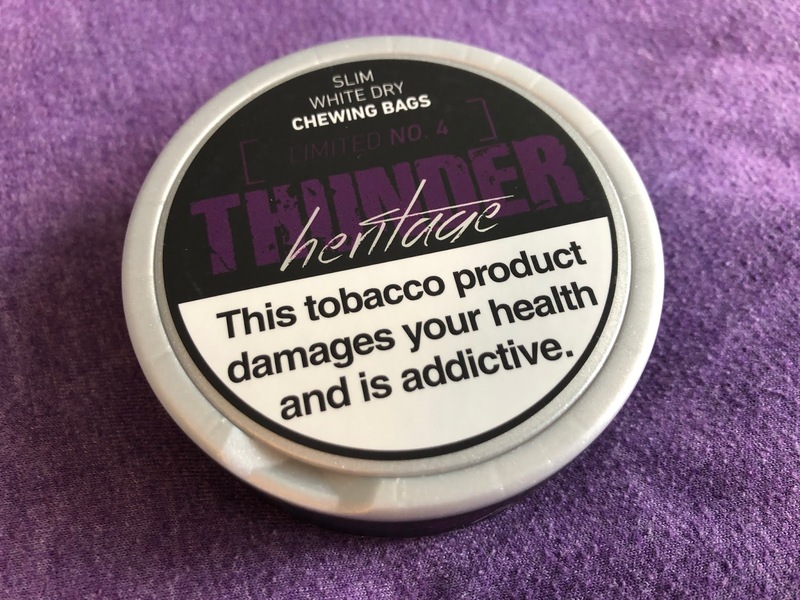 With this product you'll get the long lasting taste of a white portion, but with the perforated pouches you'll also get a quicker flavor release! In the flavor profile, the rose comes through clearly and has a lightly sweet nature to it. There's a mild herbal presence in the background which I suspect is from the heather. There's also a nice salt character, and a gentle tobacco flavor as well. The nicotine strength feels to be at the regular strength level, and I find the flavor lasts 45 minutes to an hour on average. This product has done the unthinkable: it dethroned Lundgrens Skåne Vit and is now my favorite Lundgrens product. I will be ordering more of this in the future. As of right now it's a SnusBolaget.se exclusive, but for those in the US it will be available for sale on SnusCENTRAL.com in a few weeks! Thunder NRG (White Dry) Chew Bags - Review. 18 April 2019. 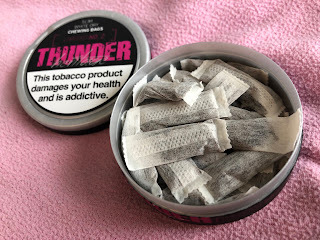 I've seen these products for sale on Northerner.com for a while now, but I haven't got around to reviewing them just yet. 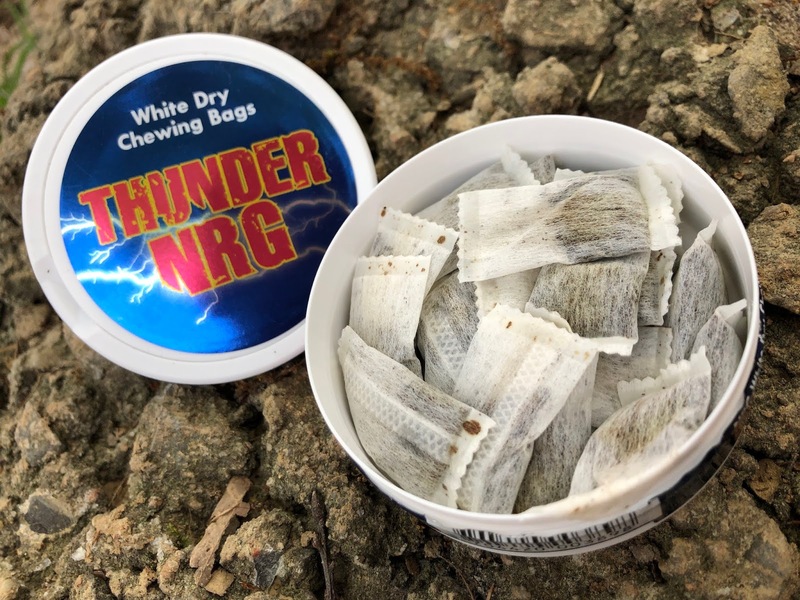 I've had some requests lately to do a review of this product, so today we're going to talk about Thunder NRG (White Dry) chew bags! I reviewed the snus version of this product back in 2017, so it's been a little while since I've tasted an NRG product. 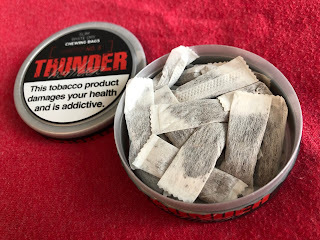 I was interested to see how close this stuff is to the snus version. This product is "energy drink" flavored, which you don't see much of. The only other one made is G3 Wire. I don't really drink energy drinks, but my fiancé does, and she said this stuff smells just like one. 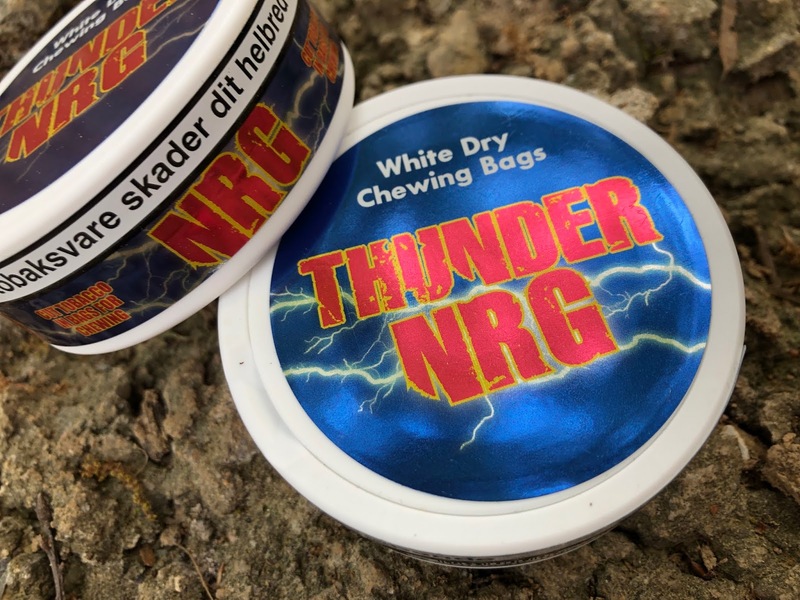 The flavor description of Thunder NRG White Dry Chew Bags says, "Thunder NRG White Dry Chew Bags has a refreshing taste of energy drink underlined by the explosive amount of nicotine". It comes in a 13.2 gram can with 24 portions for 0.55 gram portions. The nicotine content is 42mg/g (4.2%) which breaks down to 23.1mg/portion. 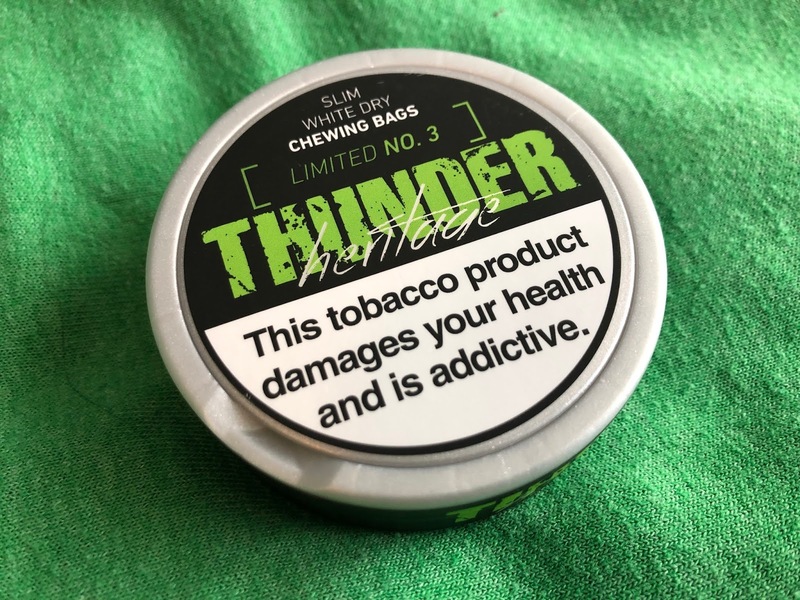 If you aren't familiar with chew bags, they're products that are made basically the same way as snus, except two minor differences. 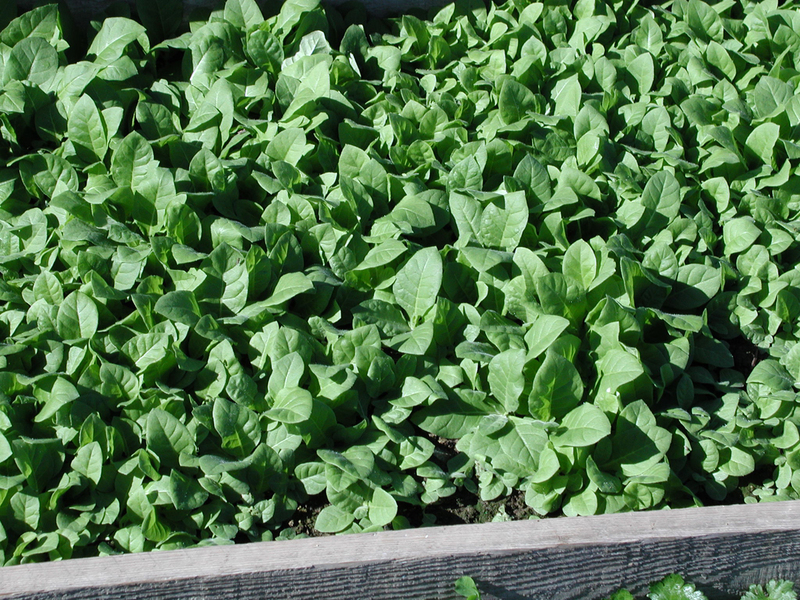 The tobacco is cut instead of ground, and the portion material is a little thicker so they can be chewed if you want. I never do, I just put them in my upper lip and use them like snus. 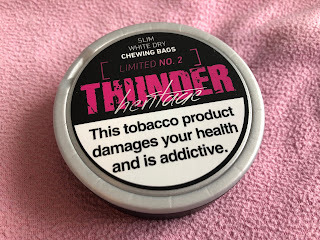 For more in depth info on chew bags, check out this video I did. For comparative purposes, this one seems pretty identical to the snus version I had in 2017. The aroma is that familiar energy drink smell - tangy, tart, and a little spicy. The portions, or chew bags, are the white dry type, which means they aren't as comfortable at first, but they get more comfortable as they get more moist in the upper lip. They also have a mild burn when you put one in. The flavor is, well, energy drink flavored. It's tart, kind of like a tangy berry flavor. It has a little spice to it, as well. It reminds me most closely of Red Bull. The nicotine hits pretty quick, and is actually quite strong. It feels well above the extra strong level. The flavor, on average, lasts up to the 1.5 hour mark, which is common of the white dry category. 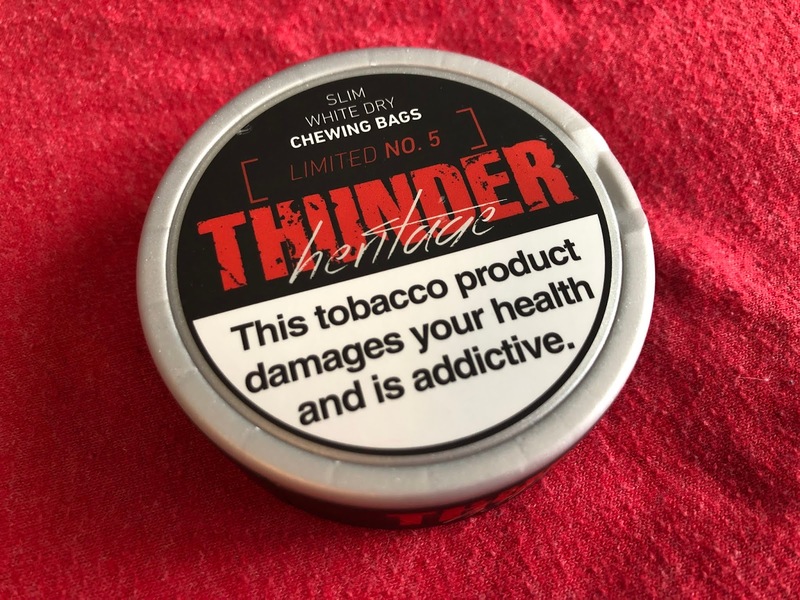 If you like energy drinks and want that flavor in a chew bag product, this may be something that is right up your alley! 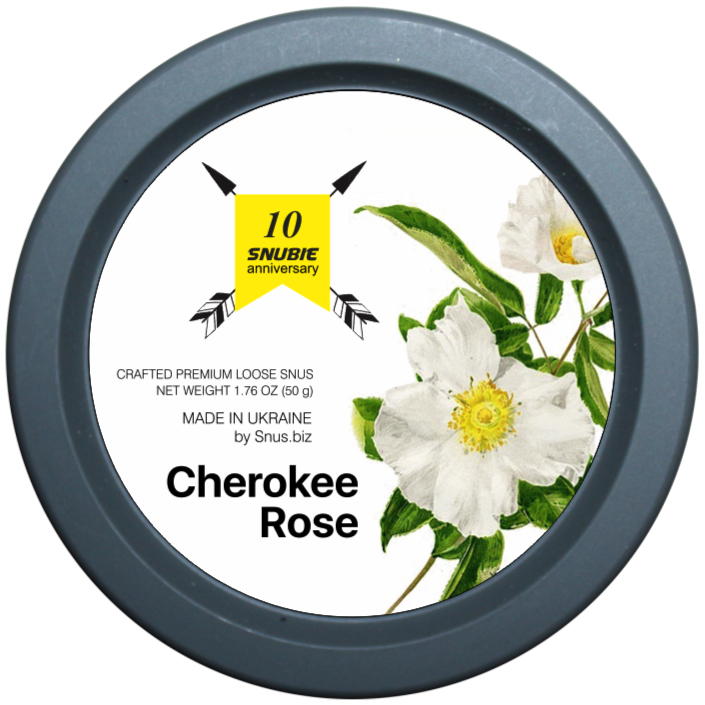 Snubie Cherokee Rose (Lös) - Preview. 16 April 2019. May of 2019 marks the 10 year anniversary of Snubie.com. This year, I wanted to do something special, so I've partnered with our friends at Snus.biz to release a special Snubie.com product. Meet Snubie 10 Year: Cherokee Rose! This product has special meaning for me. My daughter, Cherokee, was instrumental in my quitting smoking. In essence, without her, there would be no Snubie.com. So, I wanted to name a product after her. Her name comes from my family's Cherokee ancestry, and I felt it appropriate to also have a flavor that pays tribute to that. I could think of nothing better than the Cherokee Rose. Here, you can see the can design of this new product. The legend of the Cherokee Rose says: "When the Trail of Tears started in 1838, the mothers of the Cherokee were grieving and crying so much, they were unable to help their children survive the journey. 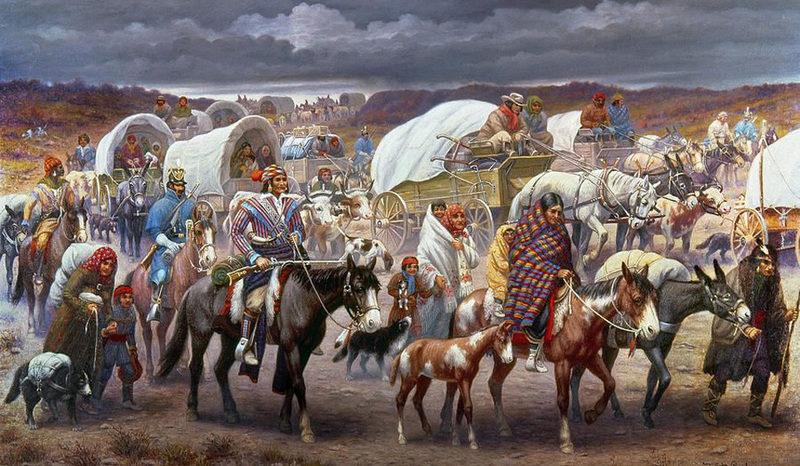 The elders prayed for a sign that would lift the mother’s spirits to give them strength. The next day a beautiful rose began to grow where each of the mother’s tears fell. The rose is white for their tears; a gold center represents the gold taken from Cherokee lands, and seven leaves on each stem for the seven Cherokee clans. The wild Cherokee Rose grows along the route of the Trail of Tears into eastern Oklahoma today." 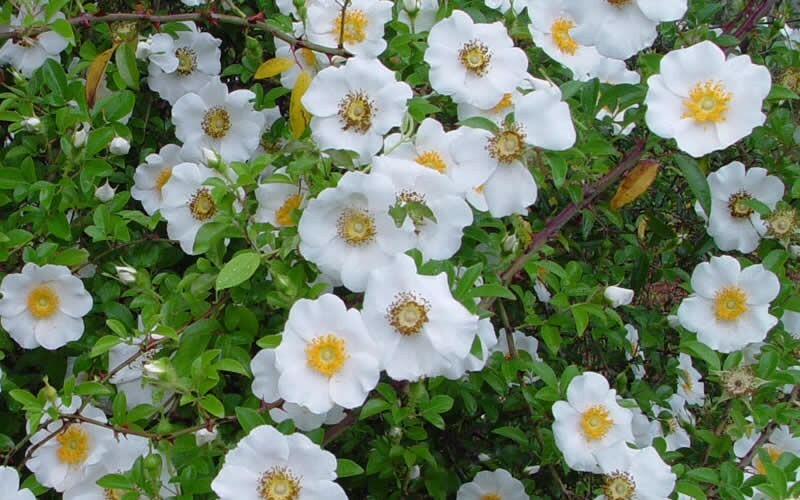 If you aren't familiar with the Cherokee Rose, or Rosa laevigata, this is what they look like. It is the state flower of Georgia in the United States. To date, I can't think of another product that has been flavored with the Cherokee Rose. For this product, we did something a little different. The tobacco itself was soaked in the rose oil before being pasteurized. Jasmine essence was added to the finished mixture to give a little extra flavor. For this product, Burley, Black Cavendish, and Perique tobaccos were used. 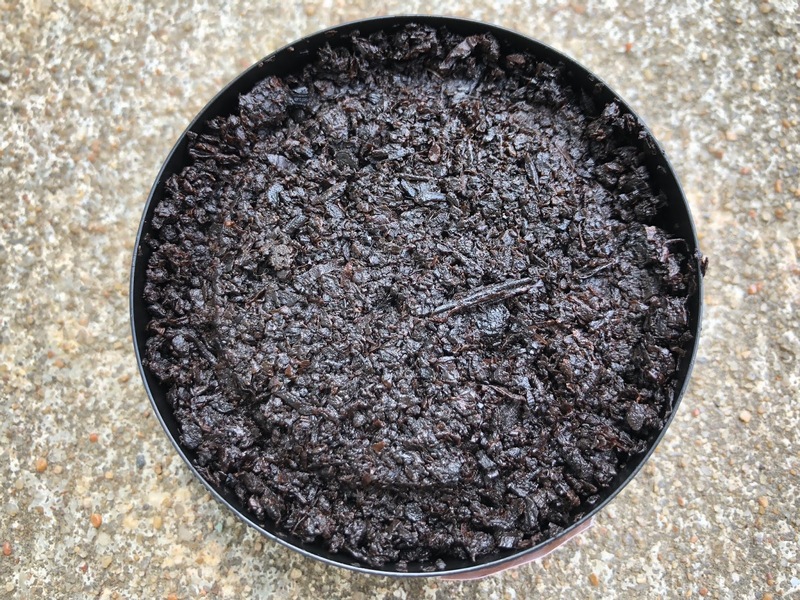 Perique is one of my favorite tobaccos and provides a tangy, zesty element to the flavor to compliment the mild, soft, nutty flavor of the Burley and the mellow flavor of the Black Cavendish. It is truly a flavorful and aromatic blend. The product was then aged in oak barrels which provides a nice wood/oak backbone to the tobacco and rose oil blend. The flavors of the tobacco and rose oil go on to mature and mellow together in the oak barrels. 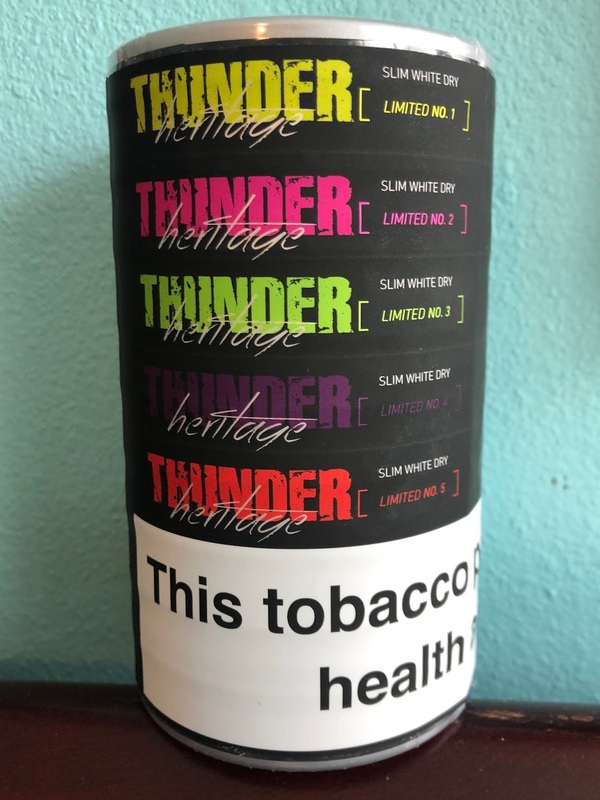 This blend is lower in nicotine, and ranges between 10mg/g-15mg/g. Not regular strength, but not extra strong. It falls right there in that sweet spot in the middle. You'll feel a little extra nicotine from it, but not too much! 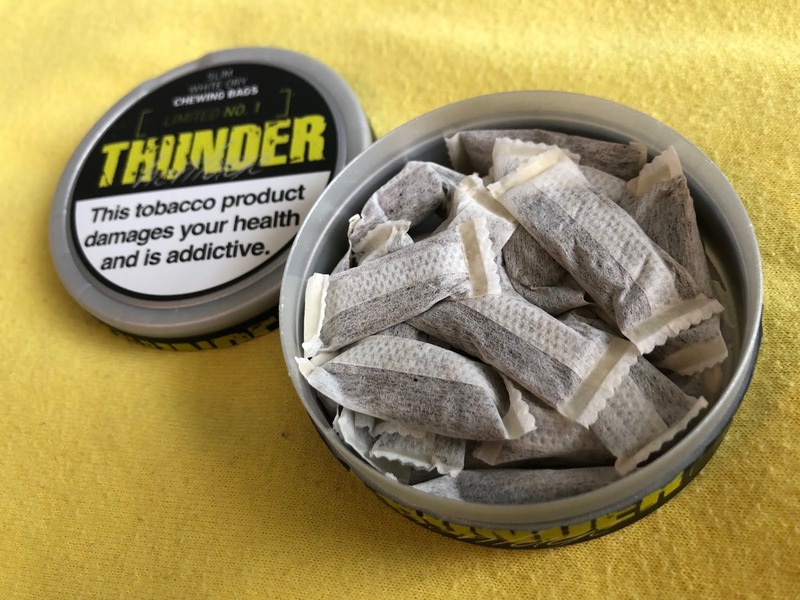 This snus comes in a special grind known as “combo grinding”. Combo grinding is a mix of coarse grinding and fine grinding. 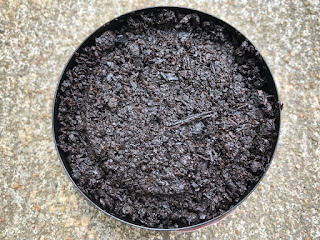 This grind is very unique, and helps release flavors in a way different from traditional lös snus! This product also comes with a full 50 grams of lös snus! This product will be available mid-May, 2019. You can pre-order it by emailing hello@snus.biz. 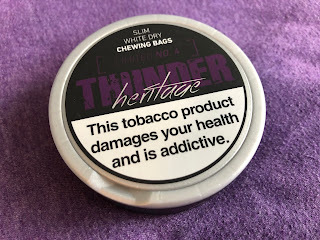 Thunder Heritage (Limited Edition) - Review. 15 April 2019. V2 Tobacco has released a new Thunder Limited Edition, this time in the chew bag format! This means it's not available for the US, but I tracked some down for review because I just had to try these flavors. I know, it's a bummer we can't get this in the US, but as I've heard from readers in the EU, it's nice that they get a limited edition, which I agree with; I think it's fair. 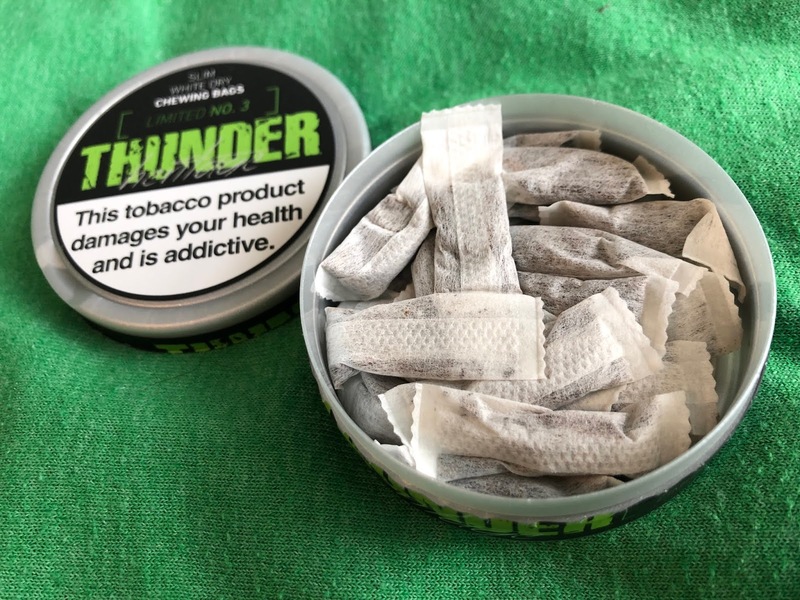 They have to watch the US get all kinds of new products/limited products, so this is a new little bonus for those who can get chew bags, but not snus. 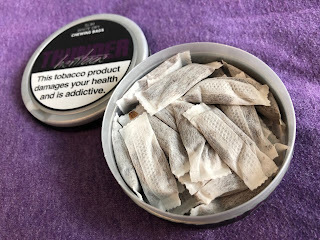 If you're not familiar with chew bags, they're products that are made basically the same way as snus, but the tobacco is cut instead of ground. Also, the portion material is thicker so they can technically be "chewed" (which makes them legal in the EU), however I never chew them. I just put them in my upper lip and use them like snus! When it comes to the Heritage line, this is how V2 describes it: "In honoring the Thunder mint tradition, V2 brings out five surprising mint infused flavors. With these five great limited mint flavors, V2 Tobacco celebrates their proud mint heritage. All Heritage limited comes in discrete slim white dry portions." Before we get into the reviews, I want to address the portions, or chew bags, so that I'm not repeating myself 5 times in this area. 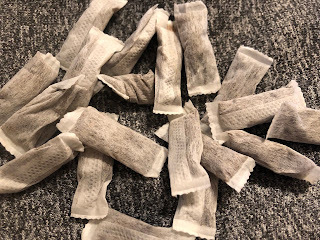 The portions, or chew bags, themselves are the white dry type, which means they aren't as comfortable at first, but as they get more moist they do get more comfortable. They are a little lighter in weight, so I do suggest fluffing them to move that tobacco around a bit. The white dry format also comes with an added benefit - the flavor lasts a really long time, usually 1.5-2 hours in some cases! The flavor description says, "a fresh mint and banana aroma with a subtle cooling sensation when used". It comes in a 13.2 gram can with 24 portions for 0.55g portions. The nicotine content is 16mg/g (1.6%) or 8.8mg/portion. When you open the can, the aroma is a mild, lightly sweet smell of banana with a light mint tone. When you put a portion in, you'll also notice a light cooling presence in the lip. The flavor is a mild, gentle, lightly sweet taste of banana with a sweet hint of mint. If you've ever had Banana Runtz candy, the banana taste is a lot like that. 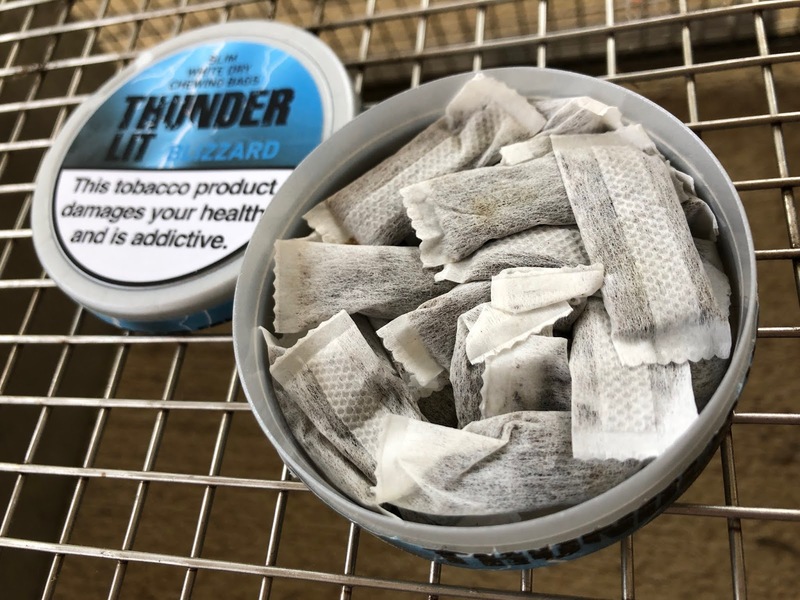 The nicotine kick feels to be right at the extra strong level, and I find the flavor lasts up to 1.5 hours on average! I really enjoyed the taste of this one, it was certainly unique. The flavor description says, "a fruity and spicy aroma which creates a unique and new flavor experience". It comes in a 13.2 gram can with 24 portions for 0.55g portions. The nicotine content is 16mg/g (1.6%) or 8.8mg/portion. Going into this one, I wasn't sure what to expect. It definitely caught me off guard. The aroma of this one is straight up pink bubble gum. I can pull a little berry out of the smell if I try, but I had my non-snusing fiancé smell it and she thought the same thing - bubblegum. There isn't as much of a cooling presence in the lip with this one compared to the other ones. The taste is very much the same as the aroma - it reminds me of traditional, pink bubblegum. I also don't really notice any mint in the flavor. The nicotine level feels right at the extra strong level, and the flavor lasts around 1.5 hours on average. Going into this one, I expected a spicy berry and mint flavor, but got a bubblegum flavor. Am I disappointed? Nope. I really enjoyed the flavor of this one, even if it isn't berries and mint. The flavor description says, "a fresh mentha and lime aroma with a subtle cooling sensation when used". It comes in a 13.2 gram can with 24 portions for 0.55g portions. The nicotine content is 16mg/g (1.6%) or 8.8mg/portion. With this one, the aroma seems to be more menthol than mint. The menthol aroma comes through first, followed by a light hint of lime. When you put a portion under your lip, you'll notice a light cooling presence, which sticks around for quite a while! The taste reminds me a lot of lime-menthol cough drops. It's a relatively mild flavor. The menthol flavor reminds me of a menthol/eucalyptus character, and the lime flavor is relatively gentle and in the background. The nicotine feels to be firmly at the extra strong level, and I find the flavor lasts up to about 1.5 hours. This is one I could go either way on. It is a unique flavor, but probably not one I would order if available on it's own. The flavor description says, "a licorice and peppermint aroma with a subtle cooling sensation when used". It comes in a 13.2 gram can with 24 portions for 0.55g portions. The nicotine content is 16mg/g (1.6%) or 8.8mg/portion. When you open a can of this one, the licorice is more present in the aroma than I expected. It's very much a black licorice presence, with a hint of tobacco, and a light mint character. There is a light cooling as well when you put a portion in. The flavor is mostly that licorice character, which is mild but not weak by any means. 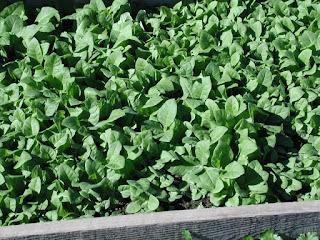 In the background, the peppermint flavor is very gentle, and lightly sweet. You already know I'm not a fan of mixing licorice and mint, so this is one I wouldn't go for again. The flavor description says, "a well rounded pomegranate aroma with a subtle cooling sensation when used". It comes in a 13.2 gram can with 24 portions for 0.55g portions. The nicotine content is 16mg/g (1.6%) or 8.8mg/portion. Next to banana-mint, this is the one I was most excited about. When I first started snusing back in 2009, I loved Mocca Pomegranate. It was a regular for me for quite a while. After that one was discontinued, I didn't imagine we'd ever see another Pomegranate snus. Until now! Like the Spicy Berries one, I didn't notice much mint in the aroma, it's mostly a mild, gentle smell of pomegranate. I didn't get a cooling presence in the lip, but there was a nice little burn! The taste is a gentle, fruity, natural pomegranate flavor. I don't notice any mint in the taste, either. Which I don't mind, as I was hoping it would be mostly pomegranate flavor anyway. The flavor, on average, lasts up to about 1.5 hours and the nicotine feels to be right at the extra strong level. As far as this one goes, I really enjoyed the taste! If you're in the EU and want something unique, the Thunder Heritage line was definitely fun to try! 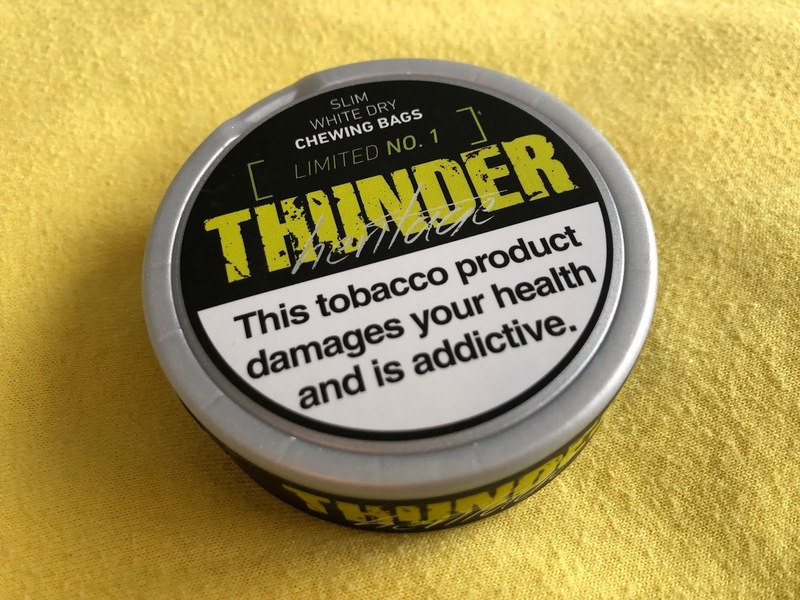 Again, sadly for those in the US, V2 has no plans to release a snus version of this at this time. This appears to be a special little bonus just for those in the EU. The second Small Batch product of 2019 is here, meet Small Batch #9: Banana. 2019 kicked off with Small Batch 8: Gin and Pepper and it looks like Swedish Match isn’t letting up, this time releasing a flavor we don’t see very often in snus. In fact, this year’s Thunder Heritage is the first time I can recall a banana flavor being released. In 2018, we saw seven Small Batch products. Small Batch 1, released in January 2018, had a taste of champagne. Small Batch 2, released in February 2018, had a taste of blood orange. Small Batch 3, released in May 2018, had a taste of apple and mint. Small Batch 4, released in July 2018, had a taste of raspberry and licorice. Small Batch 5, released in September 2018, had a taste of coffee. Small Batch 6, released in October 2018, had an odd taste of mushroom. Small Batch 7, release in November of 2018, had a taste of Orange and Chocolate. 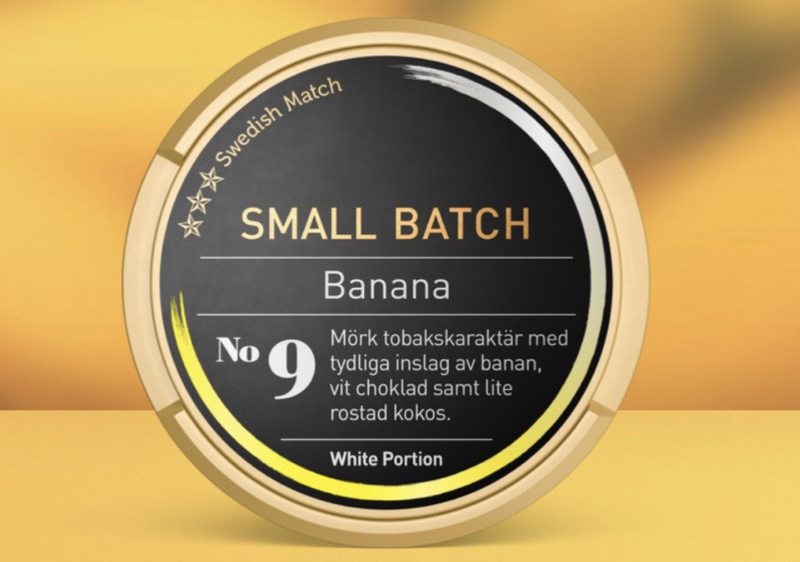 The flavor description for Small Batch 8 says “For the development of this product, we have gained inspiration from the taste balance between the banana and chocolate. Mature banana meets coconut and white chocolate. A rich and full-bodied taste that still has the undertones of tobacco." It's available now on the Swedish Match e-store. As usual, this product isn't available to the US. 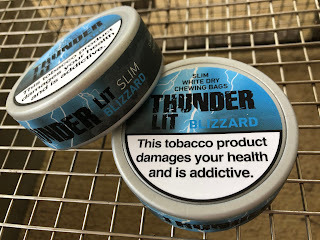 Thunder Lit Blizzard (Slim White Dry) Chew Bags - Review. 13 April 2019. 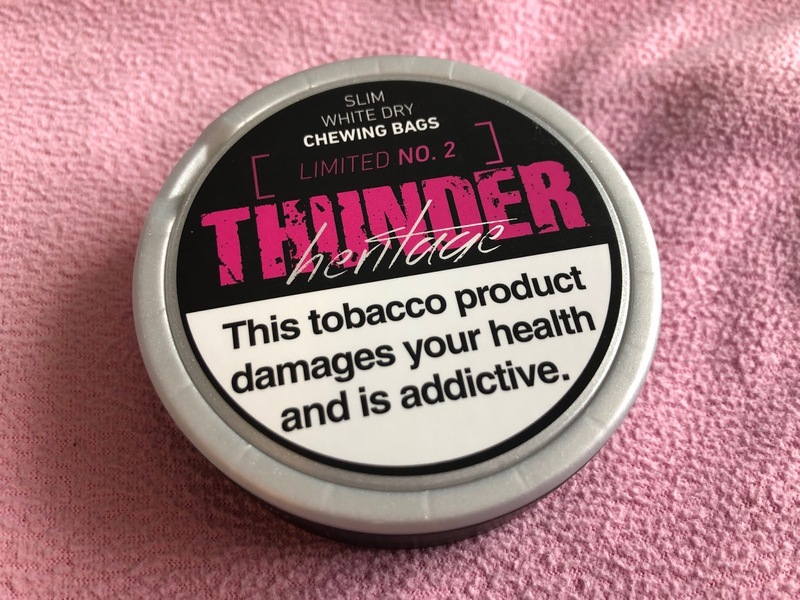 V2 has launched another new chew bag product, this one with a mint flavor. I know, there's a billion mint products out there. But, I really like the taste of this one, and I'll tell you why when we get into the review. This product also comes with an interesting and long name. As the kids say, this product is "lit". 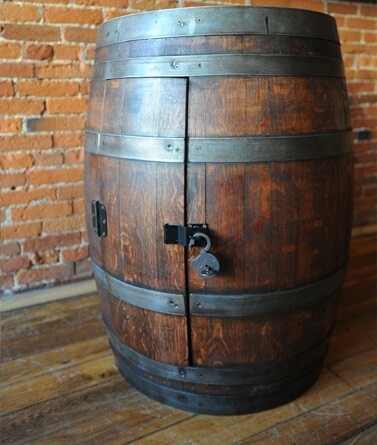 According to UrbanDictionary.com, this product is "turned up or popping". According to Northerner.com's description of it, this product has a "sweet, fresh and well-balanced mint flavor". It comes in a 13.2 gram can with 24 portions for 0.55g each. The nicotine content is 22mg/g (2.2%), or 12.1mg/portion. I also really dig the can design, I think V2 did a good job with this one. Why do I like this one so much? Because it reminds me of one of my favorite mint products - Thunder Cool Mint (Slim White Dry). This one just seems a little more dialed back on the peppermint. The aroma is a sharp, sweet, mellow smell of peppermint. 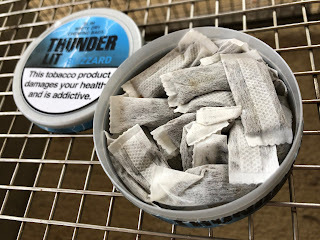 The portions, or chew bags, are the white dry type, meaning they aren't as comfortable in the lip until they get a little more moist. Being a mint product, it also comes with a nice cooling presence in the lip as well! The flavor is a sharp, focused peppermint flavor. It is mildly sweet, but pretty smooth in nature. It's also a long lasting flavor, since it's a white dry; you'll find the flavor lasts up to 1.5 hours on average! This stuff also packs quite a kick; while only 12.1mg/portion, it feels well over the extra strong level. 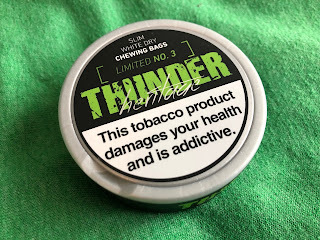 If you like the flavor of Thunder Cool Mint, you'll like this one. It's one of the better tasting mint products out there!